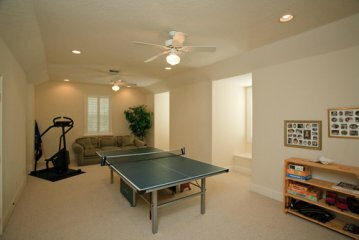 SELLER IS RELOCATING AND NEEDS PROMPT SALE! 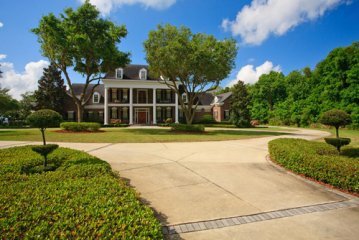 INCREDIBLE OPPORTUNITY TO BUY 5-ACRE LAKEFRONT GRAND GEORGIAN ESTATE RESIDENCE WITH 435' LAKE FRONT AND DEEP DRAFT, GAME RM, 35' LIBRARY/OFFICE, EXERCISE STUDIO, LARGE LAKEFRONT POOL, CABANA WITH KITCHEN, BOAT DOCK, BOAT HOUSE & HOIST! EXCELLENT MOVE-IN CONDITION! FORMERLY APPRAISED AT $3,300,000!! Imagine cruising through the beautiful Harris Chain of Lakes on your Pontoon Boat, with your family and friends, or - water skiing - or - fishing for trophy bass - right after closing! The Residence: This stately Colonial home was custom built for the current owner. 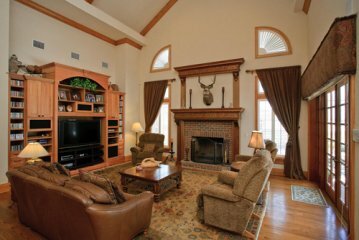 It sits on a five acre parcel directly on Lake Harris. A winding drive, along the shore of Lake Harris, under hundred-year-old Oaks, leads to the impressive all brick grand Georgian Colonial residence, built by one of the highest quality builders in the area, with its stately columns to greet you as you enter the long porch which spans the front of the residence – the perfect place for rocking chairs, and a pitcher of iced tea. 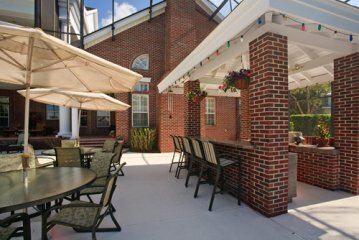 The rear of the residence features a 75’ brick, fully screened terrace and a second story balcony above booth of which overlook Lake Harris. 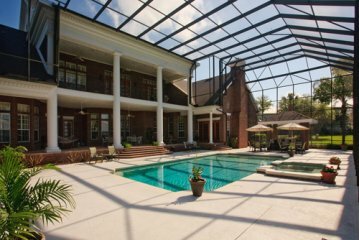 A 40’ Pool, heated Spa and Cabana/Kitchen are included in the screen enclosed terrace which offers a great expanse of decking which frames the pool – plenty of room for outdoor fun and entertaining. 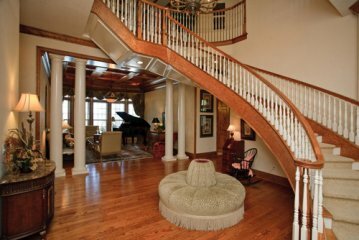 The residence is finely crafted throughout with custom millwork, soaring ceilings framed by deep moldings, beautiful hardwood floors, custom cabinetry topped with granite. 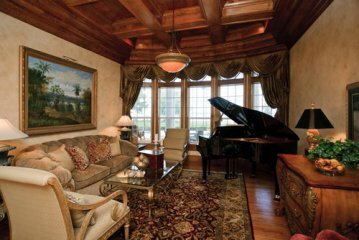 Each room has extraordinary ceiling detail; some are multi-tiered with indirect lighting. 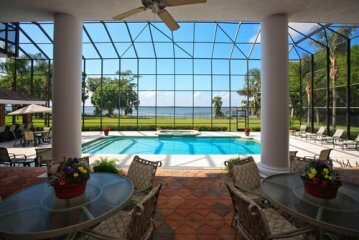 The most beautiful part of the home is the breathtaking views of Lake Harris which are framed by large windows elaborately trimmed, in so many of the lakefront rooms. 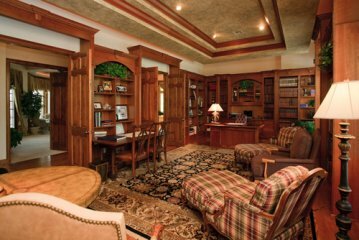 The design and craftsmanship of this estate will stand the test of time! Its architecture has been appreciated since before the days of the early Civil War! 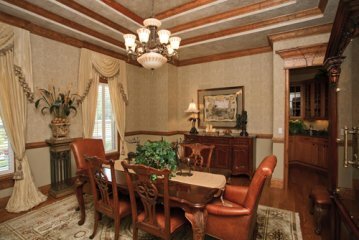 As time goes on and on – its design will remain unchanged and will never go out of style – as do most styles of homes. The home was designed for family living – but especially a Family who loves to gather friends and family members into their own environment. 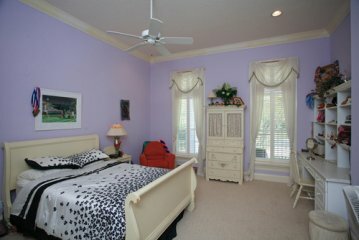 The rooms are all very large – above average – so that everyone will be comfortable. 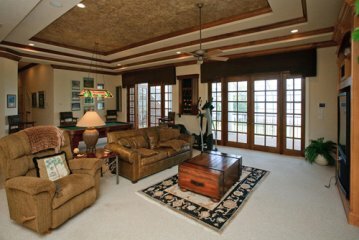 The Kitchen is family-friendly and opens to the Family Room – and each have beautiful views of the lake. 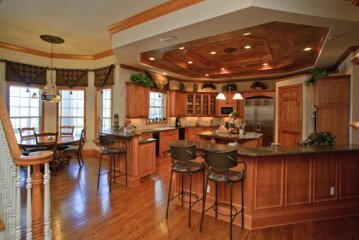 Many chefs can cook in this big Kitchen – and others can either sit and snack or watch the cooks from the long granite counter topped Serving/Snack Bars. The exterior has all the features anyone would ever want in a home! 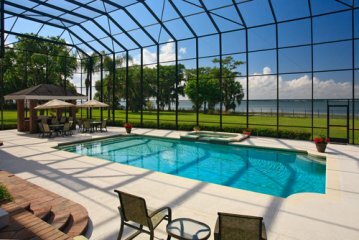 A charming Brick Terrace – an oversized Pool – a heated Spa – adjoining Cabana with wet bar, refrigerator - and especially a Boat Dock! About Lake County: Lake County is a land of gently rolling hills and a thousand glimmering lakes. It is Florida’s true natural beauty. It has small town atmosphere where southern hospitality rules the day. 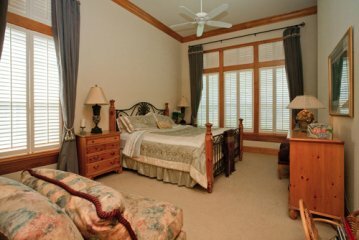 It is a perfect getaway yet only a short drive from all the dazzling magic of all the Disney attractions, Universal Studios and SeaWorld. 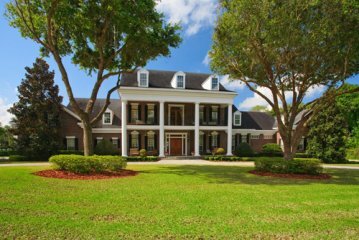 It is the countryside of Orlando – a wonderful place to live in a tranquil setting yet only minutes to major highways and the Big City of Orlando with its convenient shopping, fine restaurants, and many attractions. The Disney attractions can be accessed from Hwy 27 and the Florida Turnpike – and are only 40 minutes away – on major Highways all the way! Boating: Lake County was named for its hundreds of shimmering lakes (more than 500), which cover more than 200 square miles of it’s more than 1,200 square miles and provide plenty of waterways to explore. The Harris Chain of Lakes is a waterway system that leads north to the Atlantic Ocean, through the Ocklawaha River and the St. John's River. Fishing: The Chain of Lake’s is a fisherman’s paradise, the lakes have a great population of Largemouth Bass (many 8lbs plus), Blue Bream, Catfish, Shellcrackers, Stripers, Redear Sunfish, Bluegill, and Black Crappie (Speckled Perch). There is no shortage of advice, bait, tackle and fish camps that provide rural accommodations and good olde country cooking. Water Skiing: Another popular sport in Central Florida! Pristine lakes, year-round mild weather and sunny skies attract top-ranked skiers from the U.S. Switzerland and Brazil. From the professional to the amateur you will find plenty of boat ramps, ski-able glass, and even schools to hone your skiing skills. Equestrian: From a horse lover’s paradise and local institution for quality handmade leather tack to a world-renowned equestrian facility — Lake County is a delight for professional or novice equestrians. Enjoy a sedate ride through lakefront trails or an adventurous trek over a forest path. And be sure to stroll back in time to the horse-drawn era and experience more than 150 beautifully restored antique carriages from around the world at the Continental Acres Equine Resort & Austin Carriage Museum. Bicycling & Hiking: With higher hills than any other trails in Florida, you can view spectacular sunsets and plentiful wildlife. The Van Fleet Trail State Park is officially designated as part of Florida’s statewide system of greenways and trails. The trail in the Ocala National Forest is certified as a Florida National Scenic Trail and has been called the “crown jewel” of the Florida Trail system. There is a reason that the USA Triathlon National Training Center is located in Lake County. Leesburg: The oldest city in Lake County celebrates its Sesquicentennial this year. Fill an entire day with pleasure shopping and treasure hunting in Leesburg. Search for that special one-of-a-kind gem among the many quaint shops, charming boutiques or the huge mall of antiques on 117 acres housing 1,400 dealers. The farmer’s markets and flea markets overflow with everything from specialty orchids to imported antique weapons and farm-fresh strawberries. From vintage clothing and costumes, old south unique collectables, to exotic carousels, residents and visitors can find what they are looking for and more in Lake County. 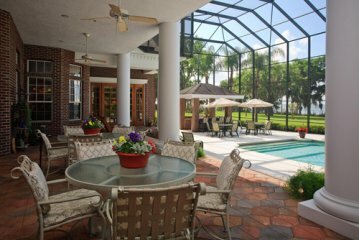 Boat Dock & large Pool! 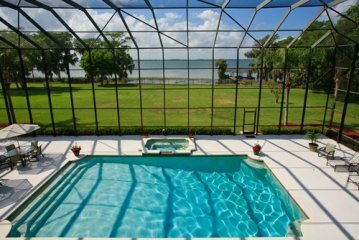 Price: $2,000,000 or FULLY FURNISHED FOR $2,250,000!! 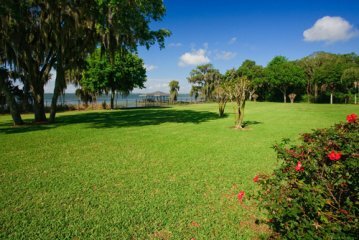 Lot Size: 5 Acres Approx.